To refinance a construction loan, the home must pass all inspections and have no pending litigation. When you build or renovate your home, you accrue significant costs that most people choose to finance via a construction loan. Once construction finishes and the home is ready to be lived in, you must refinance the construction loan into a permanent mortgage. Ensure the contractor obtained all permits and passed inspections. 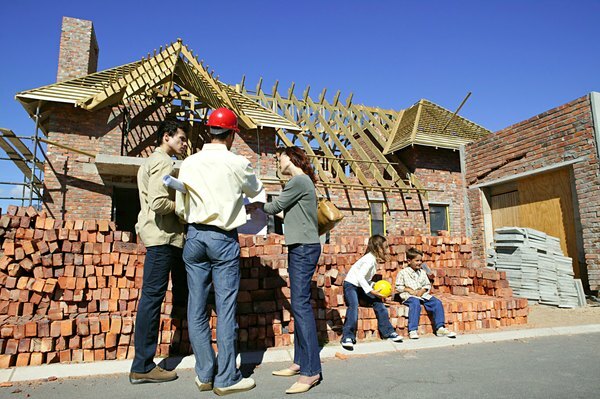 The city or county planning department provides permits for nearly every construction stage. Once the subcontractor completes the stage, an inspector goes to the site to inspect and approve or recommend changes. For example, you need a permit to pour a foundation. The inspector must approve the foundation -- acknowledge that it was properly done -- before framing can begin. Obtain the certificate of occupancy -- the COA -- or the expected date of receipt. No lender will provide permanent mortgage financing on a home without legal proof that the home is ready for occupancy. Determine if you have cost overruns that you need to reimburse. If you used savings to cover some overages, you may wish to pull cash out of the refinance to repay yourself. Save your receipts and any documentation regarding these additional costs, as most lenders require proof of expenditures. Find a lender. Compare interest rates and closing costs in making your selection. You may wish to use the same lender that provided the construction loan. If so, you may simply be able to roll your construction loan over to a permanent one. Get pre-approved for the loan. Meet all the standards to obtain the permanent loan. If you qualified for the construction loan, you'll meet the standards unless your credit degraded during the construction period. Do not start the process more than a couple of weeks before you are going to receive the COA, since most banks will only lock in an interest rate for 60 to 90 days. Obtain an appraisal. The appraiser will confirm the existence of the COA for the bank. The lender will use the appraised value to calculate the loan to value ratio (LTV) for the permanent loan. The loan amount will include payoff of the construction loan and payoff of any existing liens, including contractor liens. If the appraisal and LTV came in at the right numbers for the bank to approve your request for reimbursement of cost overruns, that amount will be included in the loan and be disbursed at closing. Proceed to closing. Even though you have been approved and the appraisal has been completed, some banks do a final check on a loan applicant's financials closer to closing, so provide any documentation or clarification the lender requests. Failure to do so in a timely manner can extend the processing time of your loan by days, or even weeks. If you are not doing a cash-out refinance, you may need to bring additional funds to the closing table. Typically, you can bring up to $1,000 in the form of a personal check. Amounts over this require a cashier's check, money order or wire transfer. Check with your closing agent or attorney. Unless you believe you can get a much better rate later, you may wish to consider the single closing option. With this option, the construction loan becomes an interim loan that finally closes once the contractor completes the home. This option is cheaper since there is only one closing. You may wish to obtain title insurance to protect yourself from any liens or title defects arising from the land acquisition and construction project. Document any costs paid outside of the construction loan if you expect reimbursement out of the permanent loan proceeds. In addition, the title company must conduct a thorough title search to catch any errant mechanics liens. Can a Mortgage Be Denied at the Last Minute? How Does Renewing a Loan Work?